My computer was attacked by spyware last night. Please help. I'm using Windows XP. 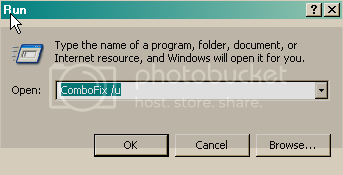 O4 - HKCU\..\Run: [ieupdate] "C:\WINDOWS\system32\ieupdates.exe"
2007-12-26 23:30	---------	d-----w	C:\Documents and Settings\Owner.LEANMACHINE\Application Data\Yahoo! 2007-12-24 13:56	---------	d-----w	C:\Documents and Settings\All Users\Application Data\Yahoo! 2007-12-24 13:53	---------	d-----w	C:\Program Files\Yahoo! My laptops running much faster than yesterday..
Did as you suggested. Here you go. Also, now the security breach pop ups have stopped. Initially when it had happened it installed 2 icons on my desktop, which on being deleted would return, now have stopped, and don't see those shortcuts anymore. All my desktop icons disappeared.. including the task bar..
Ok hit ctrl alt delete all at the same time on your keyboard to open up Task manager. Click on File at the top and then New Task run. Type in this explorer.exe then hit ok. This infection is hooked into that file that is why it killed it when you deleted that file. It worked.. Thanks.. Is that the solution to whenever that happens? Well it shouldn't happen again but yes usually that is the way to fix the problem.